A rendering of a proposed Bangor Savings Bank building at 20 South St., part of the bank's planned Bangor waterfront corporate headquarters campus. Bangor Savings Bank’s new headquarters will alleviate staff crowding and bring foot traffic to Bangor’s waterfront, the company’s CEO and president said Monday. The Bangor-based bank next year plans to move about 400 employees from its corporate headquarters at 99 Franklin St. — as well as a pair of Maine Avenue locations and its State Street branch — to its new multimillion-dollar campus along Main, South, Summer and Railroad streets. The new headquarters will be large enough to handle 500 employees to accommodate future growth and include a 400-car garage, he said. Bangor has spent millions renovating the waterfront over the past two decades, from a contaminated industrial site to grassy park area with paths and food trucks. It also has become a prominent concert hub with the annual American Folk Festival and the Waterfront Concerts music series. 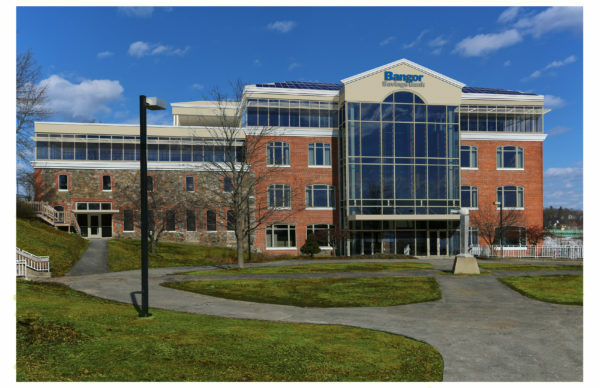 Bangor Savings Bank recorded a net income of about $25 million in fiscal 2017, which ended March 31, an increase of 8.4 percent over the year before, Montgomery-Rice said during a meeting with Bangor Daily News reporters ahead of its annual board meeting on Monday. The company plans to expand its mortgage lending and payroll operations, requiring additional workers, Montgomery-Rice said. It is unclear how many of the new positions at the headquarters would be related to mortgage lending or payroll operations, according to Carol Colson, a Bangor Savings Bank spokesperson. The new campus will reach five stories and will include 110,000 to 120,000 square feet of office space. The new positions will be added gradually over the next three to five years, Montgomery-Rice said. The bank still needs to procure city permits and planning board approval before it can move forward. Bangor Savings Bank in April purchased a pair of parcels totaling 1.5 acres at the former Bean and Conquest car dealership location at 278 Main St. and 87 Summer St. from family members of the Quirk Auto Group for its new headquarters. It also recently purchased a nearby 0.84 acre plot of land at 20 South St. and three small city-owned properties totaling 1.12 acres along Summer Street and Front Street.